WinX Free AVI to FLV Converter, a best free AVI to FLV converter software, is specially designed to free convert AVI to FLV format and change AVI to flash FLV Video with simple steps. With predetermined settings, this one-click AVI to FLV video converter freeware makes AVI to FLV conversion simple and fast without any quality loss. Embedded with Fast Video Converting System and High Quality Engine, WinX Free AVI to FLV Converter for Windows 10/8/7/XP assists you in converting AVI to FLV video file with excellent audio and video effect at unimaginable speed, as well as grabbing screenshots and saving them as PNG pictures. Meanwhile, the video/audio parameters are adjustable for user to customize output file size and quality at will. This 100% clean AVI to FLV video conversion freeware has No Spyware, Malware, Adware and Virus. Convert AVI video to FLV video at one go without additional setting. Easily extract image from AVI video and save it as PNG picture. Guarantee 100% cleanness, no spyware, malware, adware or virus at all. Audio/video parameters are adjustable; the mode of conversion is selectable. Video Setting - Select Video Format, adjust Video Frame Rate and Video Resolution to get ideal video quality. Batch Conversion - Support both single and batch video conversion mode to save more video converting time. Great Quality – Provide excellent audio/video effect and lossless sound/image quality with the help of built-in High Quality Engine. High Speed – Offer 3-5x real-time converting speed with the embedded super fast video converting system.. Choose FLV as your output format for free AVI to FLV conversion. It is also provided with many other formats and profiles. Hit the "Run" button and go! Enjoy fast video conversion speed with this free AVI to FLV converter. This free AVI to FLV converter provides you fast AVI to FLV video converting solution. 100% free and clean. 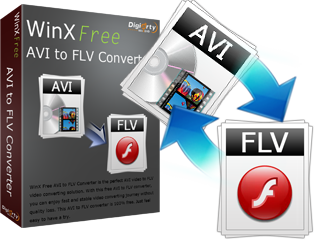 Just feel free to enjoy the amazing converting journey WinX Free AVI to FLV Converter bings to you. If you need to convert AVCHD, MTS, M2TS, MKV to iPhone, iPad, iPod, PSP, Xbox, Android, you can try WinX HD Video Converter Deluxe. How to Convert AVI to FLV with Free AVI to FLV converter? Flash video is a container file format to deliver video over the internet. It's the best format for the compressed video in Flash (best quality, smallest file size). So before you upload AVI video files to the web, you need to convert AVI to FLV format. AVI video format is widely accepted but not for iPad, so you need an AVI to iPad 3/4 converter for AVI to iPad 3/4 playback. It can help you convert AVI to M4V, MP4, H.264, MOV, etc for Apple products with best possible quality. Nowadays, YouTube has become the most popular online video site.If you are looking for a way to rip DVD to FLV which is supported by YouTube, you need the assistance of WinX Free DVD Ripper, a totally Free DVD to FLV Ripper. As the foregoer of HD MKV video, though AVI lacks some of advanced features, it is still much more stable and compatible with PC computer and many other devices. For this reason, converting MKV to AVI is always a growing trend. To make sure the MKV to FLV conversion works smoothly and fast, we need to get a professional MKV to FLV video covnerter, like WinX HD Video Converter Deluxe.